You can find the pattern on-line at allpeoplequilt.com under Project: Summer Table Runner. Great for using up smaller scraps or I used one piece of fabric for the melon. Made some matching red check napkins using my BabyLock serger, and I’m ready for the picnic. Love my Imagine Serger by BabyLock. Auto threads so you can quickly change out threads. Joe at Quilting Elements in Ashland has just become a BabyLock dealer and would be happy to show this little dream. It truly is just a push of a button. It seems like forever and now is the time to make another road trip…..Ironwood, Michigan to the Fabric Patch and Ashland, Wisconsin, Quilting Elements. Want to get up there before Fall is upon us…..Tuesday, July 31st is the day. If you’re interested, we’ll be meeting in Trego at the Trego Travel Center at 9am to caravan and/or carpool North. Our last road trip was in April to Port Wing and the Little Gift Shop. We had a fabulous time. When we were out visiting some shops on the Wisconsin State Shop Hop I noticed the bookmarks have been posted for the Annual Falling Leaves Shop Hop – September 28th – October 6th. Can’t wait! This year Gwen Lundgren from the Twin Cities has designed a quilt for this event and each store you visit you will receive a “FREE” fat quarter and pattern piece for the quilt. There’s also a new twist to “find each shops favorite thing”…..don’t know what that’s about, and can’t wait to find out. This is truly an annual favorite. It’s a great kick off for Fall and your creativity will soar when you see all of the great projects from each shop. While on the the Wisconsin State Hop visiting some favorite shops, stopped in to Pins ‘n Needles and Mary has some awesome new socks! 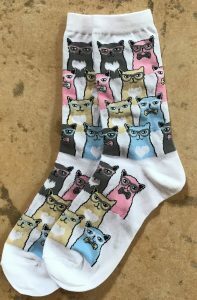 Yes socks…..aren’t they awesome? I’ll be stylin’ come sock weather. 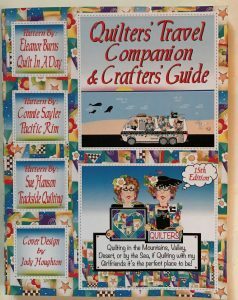 She also has the new Quilt Shop Navigator. This quilt shop guide will navigate you to some wonderful quilt shops wherever you may travel. 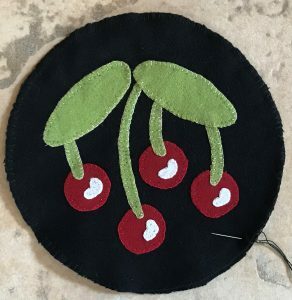 Life truly is a bowl of cherries. Full of lush beauty for all to enjoy…..I’m so very thankful. Remember…..road trip….July 31st It will be fun with lots of laughs and creative inspiration. Subscribe to our mailing list to receive an email when we post new articles!